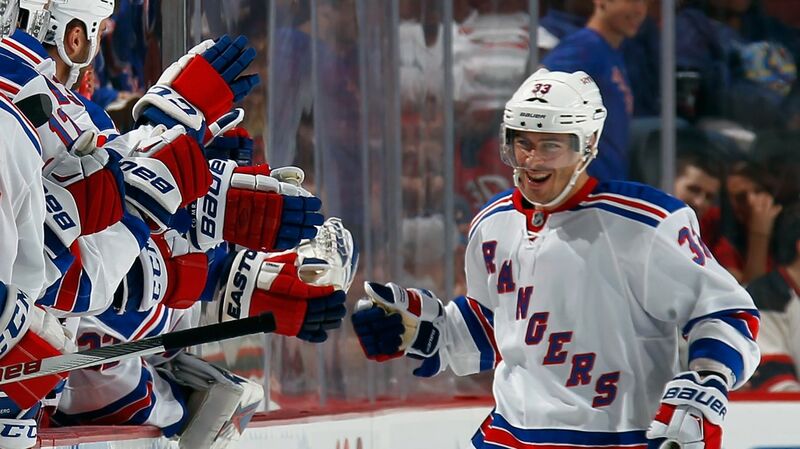 ← Is a seven man defensive rotation a possibility for the Rangers? Raphael Diaz cleared waivers, but where does his future lie? Photo courtesy of Getty Images. After a successful summer and some smart moves to improve the roster from top to bottom, the Rangers headed into training camp with some questions. Who would play center, would the prospects finally crack the roster, and what would the line look like? These were just a few of the questions that plagued Vigneault and his staff. With the preseason over, there are still a fair amount of questions that remain unanswered. The Rangers current roster situation doesn’t make much sense. During the preseason, Vigneault talked about wanting to keep eight defensemen and 13 forwards, but wasn’t sure if they could fit it under the cap. Instead, the Rangers decided to keep 14 forwards and push themselves right up against the salary cap. If you’re scratching your head, don’t worry, a lot of other people are too. After waiving Raphael Diaz, they decided to keep Tanner Glass on the roster along with Emerson Etem, even though there is seemingly no spot for Glass on the team. Even if Etem is kept out, someone else would have to sit for Glass to play. With that in mind, I really find it hard to believe that the Rangers roster will stay this way for long. Rangers GM Jeff Gorton has constantly talked about creating cap space and allowing the team to flexible, so I would be hard-pressed to believe that he wants two forwards sitting every night. After Oscar Lindberg and Dylan McIlrath forced their way into the lineup, which was beneficial for the Rangers lineup and salary cap situation, the team had more forwards and defensemen to choose from than initially thought. Raphael Diaz was one of the lineup casualties sent to the Hartford Wolf Pack following the preseason. After surprisingly clearing waivers, there were rumors that he wouldn’t report to Hartford so he could play hockey in Europe. However, he switched from his initial decision, and said that he would report, but if he wasn’t back in the NHL within a month, he would ask for a release so he could go play in Europe. Diaz’s one year deal is very affordable (700k) and his NHL experience could prove to be very valuable for some team. A month gives Gorton enough time to restore order to the situation. Before training camp, I had wrote about McIlrath’s drastic improvement during the AHL season, as well as the possibility of clearing cap and trusting the youth on defense. I still agree with that, and after watching a very impressive performance from McIlrath during the preseason, I think he could handle an NHL starting job. Perhaps the Rangers are waiting to see how he plays at the NHL level during the regular season before handing him a job, but if he does well, a big defensive contract could be on the way out. For people who keep commenting, Girardi and Staal won’t be traded. The team loves them, they love New York, and they have no trade clauses. Same goes with Dan Boyle, the undeservingly criticized defenseman that has one year left on his deal and a NTC. The only movable contract on defense is Kevin Klein. This has been talked about A LOT, so I feel like I’m beating a dead horse here, but the possibility is there. Klein was good before breaking his arm in March, surprising everyone with his surge in offensive production, but was it a fluke? More importantly, is he $2.3 million better than Dylan McIlrath? Klein is a third pair defenseman making second pair money and possibly playing above his ability. It may be worthwhile to trade him now while his value is high, re-call Diaz and let McIlrath grow and develop at the NHL level. This clears cap space now, and gives the team money for the future for guys like Chris Kreider, Kevin Hayes, and Keith Yandle after this year. 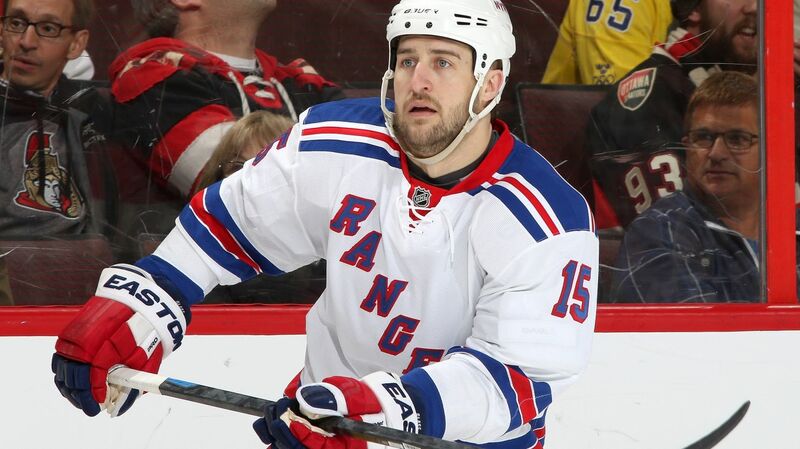 With Tanner Glass, the situation perplexes me. He’s a very great person and a great teammate, but that doesn’t translate to on-ice success. His play did get better as the season progressed, and he wasn’t a detriment in the playoffs, but he doesn’t help offensively. It’s smarter to get a more versatile forward on the fourth line. However, Vigneault really like Glass and used him a lot last year. Emerson Etem will get a long leash to learn the Rangers system. The team seems to trust Jarret Stoll, but is he on the outside looking in? It’s a weird situation, and I really don’t know what’s going to happen. All I know is that the roster won’t be this way for long. This doesn’t mean that something is going to happen immediately. Glass returned to practice today paired with McIlrath as a spare, while Etem was rotating with Jesper Fast on the fourth line. Vingeault is notorious for tinkering with his lineups so there will be changes. 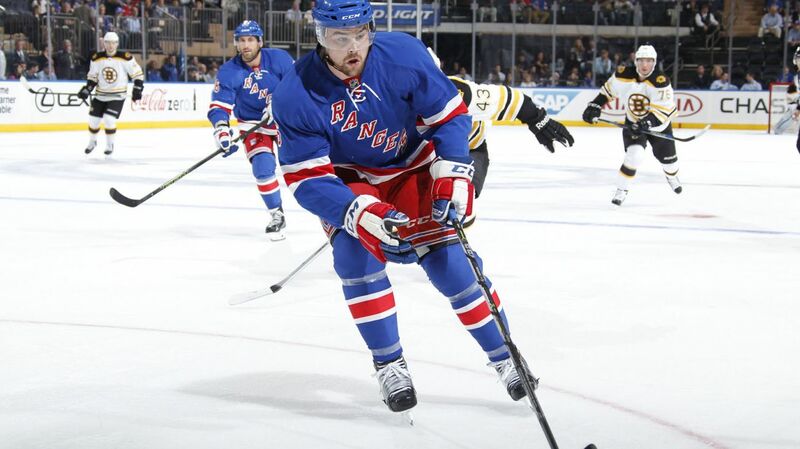 Whether Glass is around because Vigneault insists on it or because Gorton is looking to move him, nobody knows. But there will be answers soon. And there could be a trade. Posted on October 5, 2015, in In the Crease and tagged Alain Vigneault, Dylan McIlrath, Emerson Etem, Jarret Stoll, Jeff Gorton, Kevin Klein, New York Rangers, New York Rangers blog, NYR, Rangers, Rangers blog, Raphael Diaz, Tanner Glass. Bookmark the permalink. 4 Comments. One key correction to the above: Girardi, Stall and Boyle all have NMCs, not NTC’s, meaning they COULD be moved to one of 10 teams they each designate. Very different scenarios vs them having all-encompassing NTCs. And interestingly enough, Hank has a NMC as well while Nash has a NTC. Seems kind of a** backwards, IMO. Great piece but I have to respectfully disagree. I think trading Klien is not a smart move for a team pushing for a Stanley Cup. He shoots right handed, makes a moderate salary and can play defence, also showed he can chip in the odd goal or two. I say trade Boyle. He is a defensive liability, isn’t the offensive threat he once was, makes WAY too much money and is redundant with us having Yandle. Yandle is far superior on the PP. McIlrath would look just fine playing a safe defensive game along side Yandle, allowing Yandle some flexibility in joining the rush. I know I’ll get beat up here but anyone who looked at last years playoff objectively can see just what a poor d-man Boyle is. He never cleared the crease, never won a corner battle and was toasted regularly by opponents left wingers. Thanks for the comment. And all opinions are welcomed so always feel free to share. I just worry that Klein’s year was a fluke. What if he only scores like 4 goals and 12 assists, in line with a typical year from him. Yes he can be a solid defender, but regardless of how you look at things, the Rangers will need more than just Boyle’s cap free for next season. Maybe we hold off and make that trade next year, if not at all. I don’t think Boyle is a liability on defense. He actually was one of the better d men in the playoffs with all of the injuries, expecially against the Lightning. He’s extremely capable of driving possession, and the only thing better than having Yandle at the point in the power play is having Yandle and Boyle at the point on the power play. I do agree that he makes too much though. But that Sather’s fault, not his. I think that the preseason proved that having R-L on every d pair isn’t a necessity.